With the ongoing ‘heat wave’ forsythia should be in full bloom and overwintered adult annual bluegrass weevil (ABW) should have started their spring migration soon. But no reason to panic. Adult ABW are best controlled when forsythias are half gold:half green, when most of them are on the short-mown turf but have not started laying eggs, yet. And given the reversion to cool weather in the coming week (4/15-18), that will likely not happen until early May in central NJ. The overwintered adults mate and will start laying eggs around the time when eastern redbud and flowering dogwood start to bloom. The young larvae feed internally in the plant. The 3rd stage larvae start moving between plants and this happens around the time when the common hybrid Catwba rhododendron are in full bloom. The 4th and 5th stage larvae feed completely externally near or on the soil/thatch surface, often on the grass crowns, thereby causing most of the damage. The larvae pupate shallow in the soil and start to appear as the adults of the spring generation around late June, peaking typically in early July. An additional 1-2 generation occur in the summer. Managing ABW efficiently during spring will affect how problematic ABW may be during the rest of the season. But excessive use of insecticides is not a good idea with this insect: It will come back with a vengeance. Insecticide resistance is a growing issue, and things can get pretty ugly out there. If you have reason to believe that your ABW are already resistant check my soon to follow blog on that. To avoid this highly undesirable scenario insecticides should be applied only where and when necessary and pyrethroids should be used only once per year. The need for an application has to be based on the risk for damage. Risk to an area increases with increasing percentage of annual bluegrass in the sward, if there is a history of infestation, and obviously with increasing density of ABW adults (or later larvae) observed. Control efforts should concentrate on the larger larvae as that allow more precise monitoring and with that more targeted treatments. 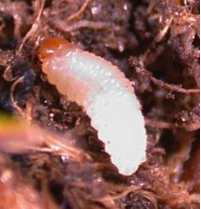 Controlling the small larvae with systemic insecticides has to be based on presence of high adult densities which is a less direct monitoring method than monitoring for the larger larvae. But for both larger and younger larvae, several very effective and yet soft-on-beneficial insects products are available. Allowing predatory insects to play a greater role in suppressing ABW and other turf insect pests will not only reduce the need for insecticide applications but also slow down insecticide resistance development. Use different approaches for areas with different degrees of risk. 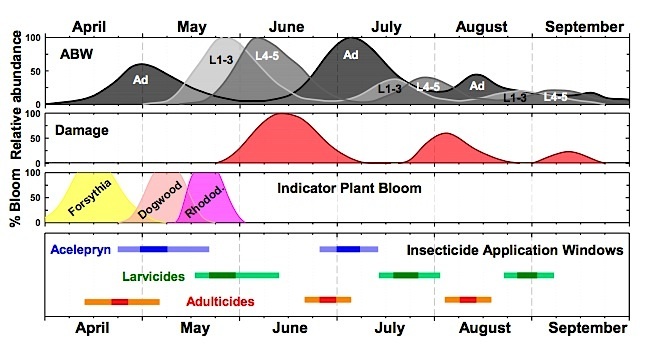 Where risk is low, monitor for larvae starting at full to late bloom of rhododendron. If significant numbers are detected, Provaunt (indoxacarb, 0.225 lbs a.i./acre), Conserve (spinosad, 0.4 lbs a.i./acre), or Dylox (trichlorfon, 8.1 lbs a.i./acre) may be used. Larvicides, especially Conserve, must be washed off the foliage into the thatch and top soil with 0.1-0.2 inch of water as soon as possible after application. For areas at greater risk, monitor for adults when forsythia is half gold : half green. If significant densities are detected, apply Acelepryn (chlorantraniliprole, 0.15-0.26 lbs a.i./acre) at onset of full bloom eastern red bud and flowering dogwood. In areas with particularly high risk, monitor for larvae and apply another larvicide (see above) if necessary. Only in areas with particularly high risk should adulticides be applied. Soon after detection of significant adult numbers (around forsythia half golf : half green), use an adulticide (Provaunt, Conserve). In areas with particularly high risk a pyrethroid may be used instead [Talstar (bifenthrin), Tempo (cyfluthrin), DeltaGard (deltamethrin), Scimitar (lambda- cyhalothrin)]. Where insecticide resistance is suspected, products containing chlorpyrifos may be used instead (1 lb a.i./acre). The pyrethroid-neonicotinoid combination products Allectus (bifenthrin + imidacloprid) and especially Aloft (bifenthrin + clothianidin) are as effective as adulticides as bifenthrin alone. For more detailed info see Koppenhöfer et al. 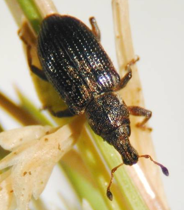 (2012: Controlling annual bluegrass weevil: optimal timing and rates. Golf Course Management, March 2012, 98-104), Koppenhöfer et al. (2012: Managing pyrethroid-susceptible annual bluegrass weevil. Golf Course Management, April 2012, 104-110), and ABW presentation on my webpage http://www.rci.rutgers.edu/~insects/amk.htm.